It was mostly out of nostalgia that Barclay and I read Charlie and the Chocolate Factory this week. I had completely forgotten (or just never realized) how terrifying that book is. Hilarious, too, but terrifying. A quick and easy read, written for children, and quirky and interesting and fun, but terrifying. Like a horrible nightmare that makes you laugh sometimes but also has a bunch of valuable life lessons in it, like don't ever chew gum. If you haven't read it, I'd say do, but I'd also say don't. I'm not sure how a person would manage to do both, but I'd recommend trying. In any case, you've probably seen one or both of the movies (which aren't even half as sinister as the book) and remember the Mike Teavee plot line, where Mike gets sent by television and shrunk and then Wonka puts him in a special machine he has for testing the stretchiness of chewing gum. I don't really care how much TV you let your kid watch, but I guess it got me thinking a very little bit about myself (oh, what's new, Suzy) and my own entertainment intake (including internet) and my own powers of thinking and how I wouldn't like them to rust and freeze. But mostly it got me thinking about how I would not like to be stretched in a machine designed to test the elasticity of chewing gum. 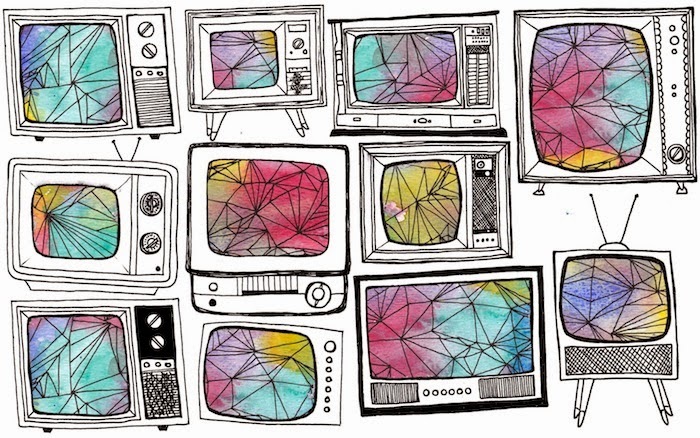 Anyway, so then I drew this picture of a bunch of old TVs. It was relevant and therapeutic and got my mind off of that dang book.